Mollington trainer Paul Webber is tempted to run Indefatigable at Newbury on Saturday. Indefatigable, who arrived at the yard earlier this year, justified Webber’s early optimism for the current campaign when landing the spoils at Uttoxeter last weekend. The five-year-old won the Stoke Audi Mares’ National Hunt Novices’ Hurdle in the hands of Gavin Sheehan and may make a swift return to the track this weekend. 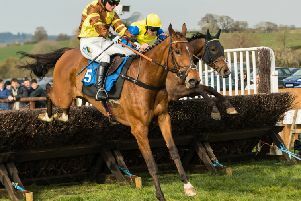 The Cropredy Lawn handler said: “She is a very nice staying mare who was hampered at Newbury on her last run but we ran her there at a big, galloping track as we like her. And Indefatigable may head to Newbury on Saturday for the Listed Ladbrokes Mares’ Novices’ Hurdle. Webber said: “They re-opened a Listed mares’ novice hurdle race at Newbury on Saturday, because there were only five entries, which has now got 11. “We’ll see how she is later in the week and if she is fresh enough she may well run there. If not, we’ll probably wait until Haydock later in December.